In looking at my photos and thinking back over the flurry of activities spanning the last few months, I realize that I have quite a few events to catch up on. I truly hope to get to them, if for no other reason than to post the photos so those who attended the events can enjoy them and download if they wish. So, I know it’s kind of random, but I’m starting in the middle of the season. 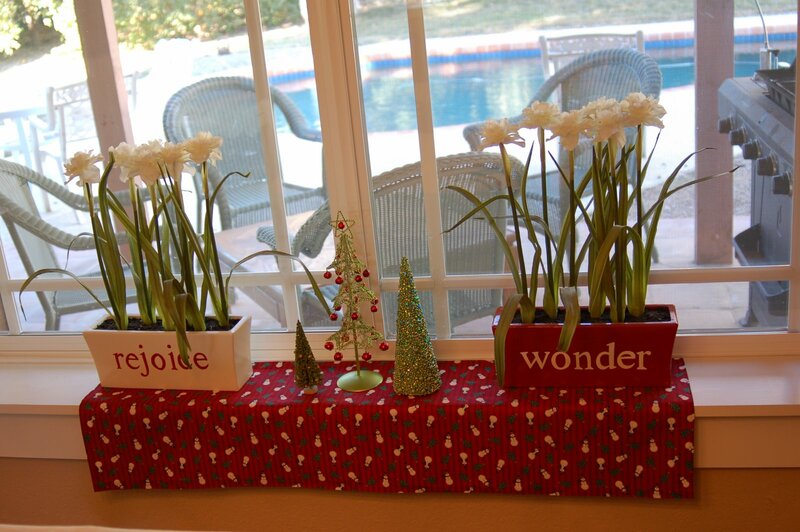 I’ve been wanting to post some pics of some new decorating at the house, just because I was excited about doing them. I really love the process of taking out all my decorations, rediscovering the few treasures that I bought the year before (on sale after the holiday) and maybe even adding a few more items for the new year. I’m sure that I’ve never decorated the same way twice. You see, I really do love change and variety, but I don’t start from scratch each year either. It’s a gradual progression from one year to the next. 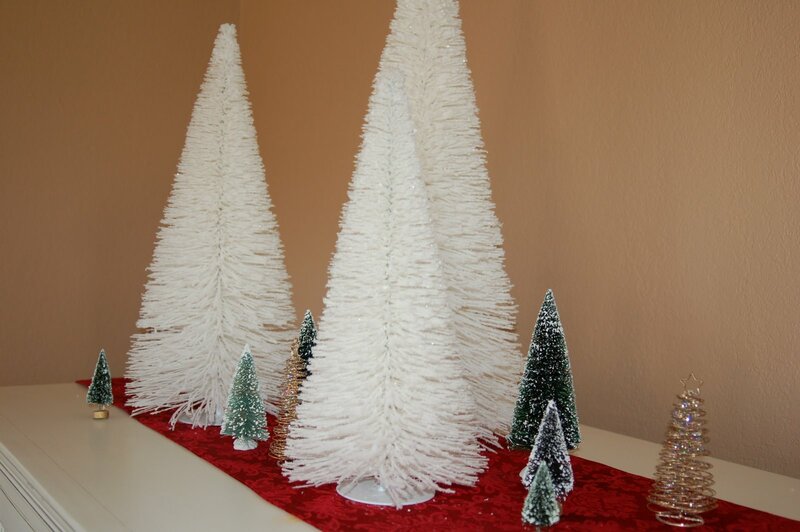 Now that Christmas is over, it’s not as relevant, but still may spark some creative ideas for you. The photo at the top is the winter version of my branch in the living room. I’m having a lot of fun with this latest addition to the room. You can see the Fall version here. 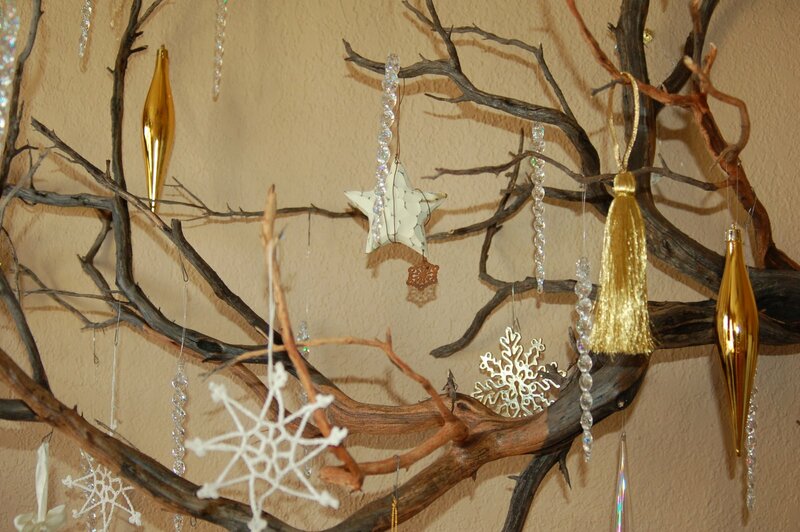 I decided on crystal, gold and white for the branch, which gives it a formal, yet natural and “sparkly” look. 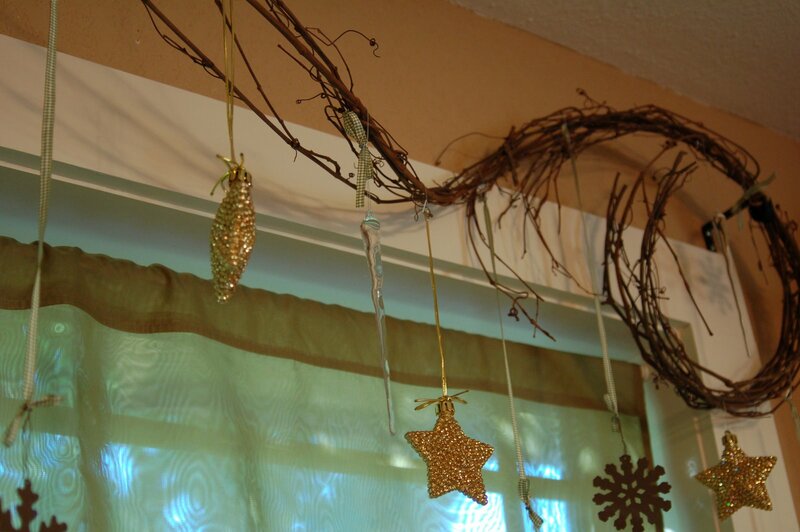 It includes, snowflakes, icicles, gold ornaments, stars and tassels. I like how it turned out! I found the gold ornaments and tassels at Ikea for a steal and I’ll bet they’re all half off now. If you’re lucky enough to have an Ikea nearly check out their Christmas decorations. Lots of awesome stuff for less than you’d pay almost anywhere. 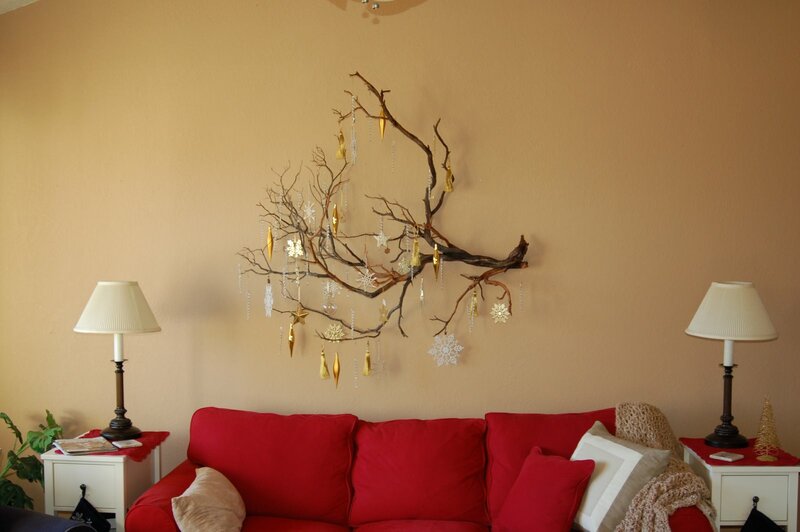 For anyone who’s interested, I did see some similar Manzanita branches (not quite so big) for sale at a local decorating store that’s going out of business. If you want more info on the store, I can look it up. It’s at Shea Blvd and the 101. The store used to only be open to decorators, but apparently they weren’t doing well, so they opened it up to the public while they’re in the process of selling all their inventory. They had some nice items and decent prices, but it will probably be pretty picked over soon. 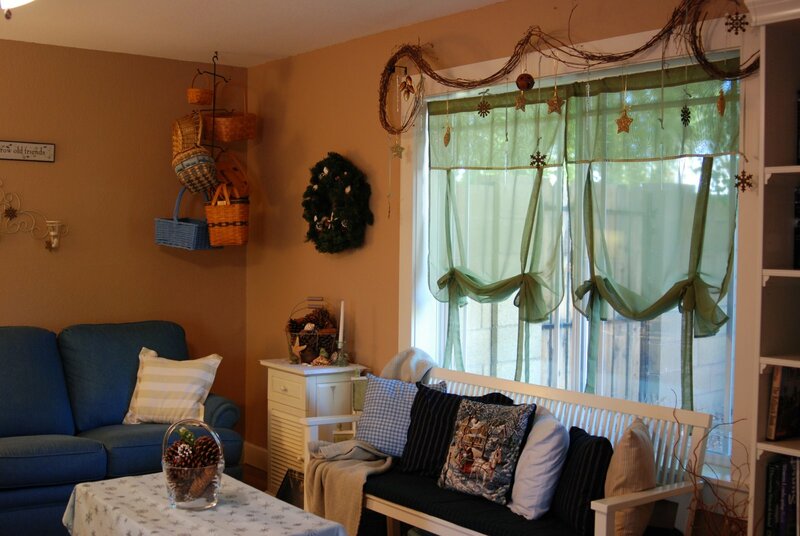 I added a grapevine garland in the family room (bought at the store I mentioned above). 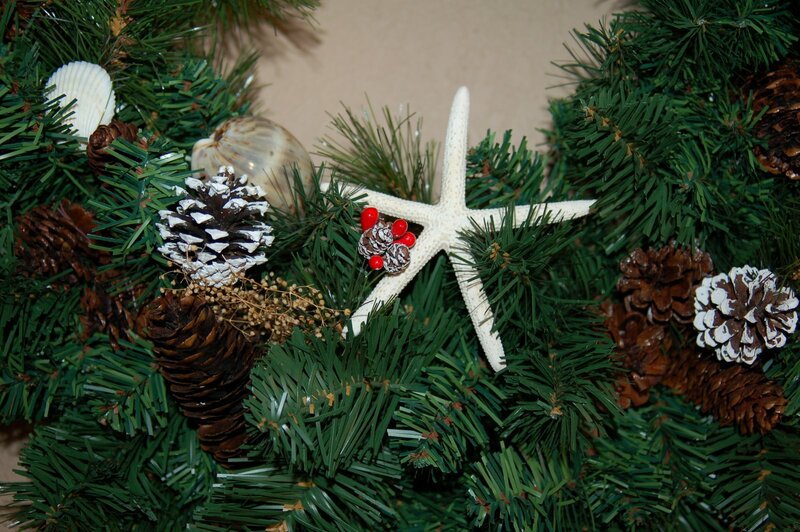 The whole house is pretty casual, but this room is especially, so I chose more natural & rustic items, like pine cones, icicles, shells, and a few of my bird figures. 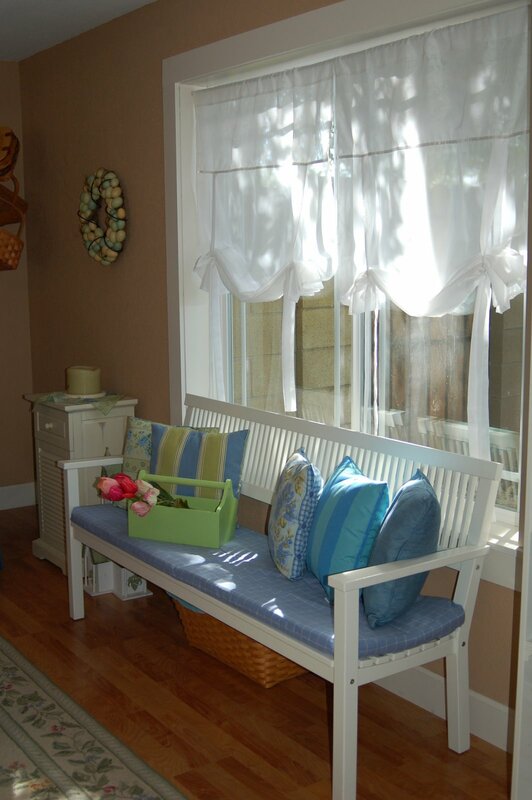 I added some soft flannel to the bench cushion and pillows to make it feel a little more cozy for winter. (you can see the Spring version of the bench here too, to get an idea of the seasonal changes.) Good thing is that since the family room is in blues and greens, we don’t need to take down much for winter. 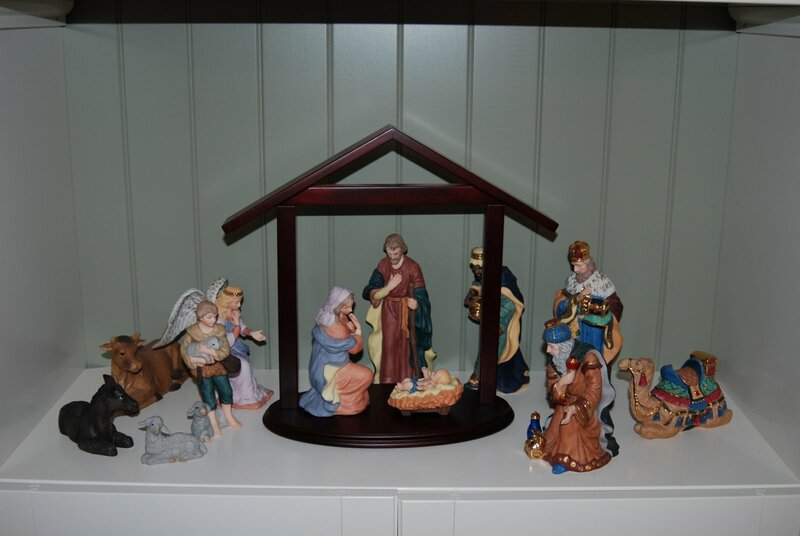 The nativity, stockings and the tree will come down soon, but much of the rest can stay up for another month or so. 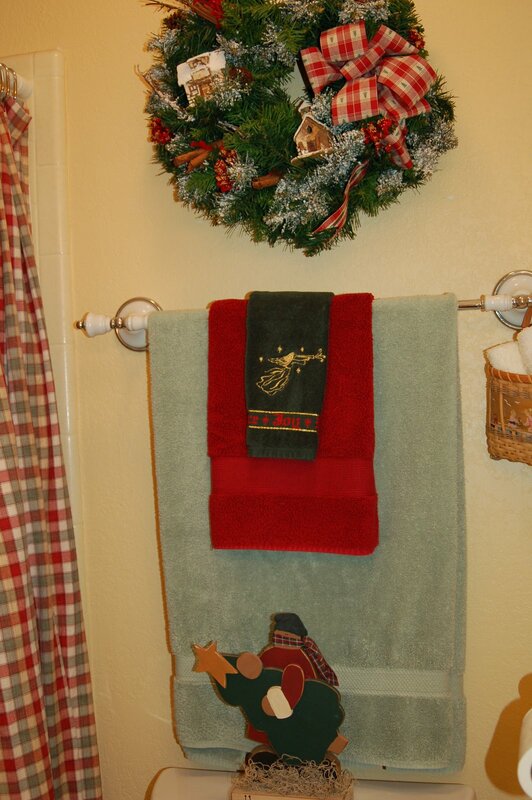 The bathroom got some sprucing up as well. I really love that the buttery yellow on the walls can be adapted to any season! A few years ago I found the sage green, maroon and pale yellow shower curtain that goes well with fall or winter. It’s fun to decorate that small room because a little goes a long way. 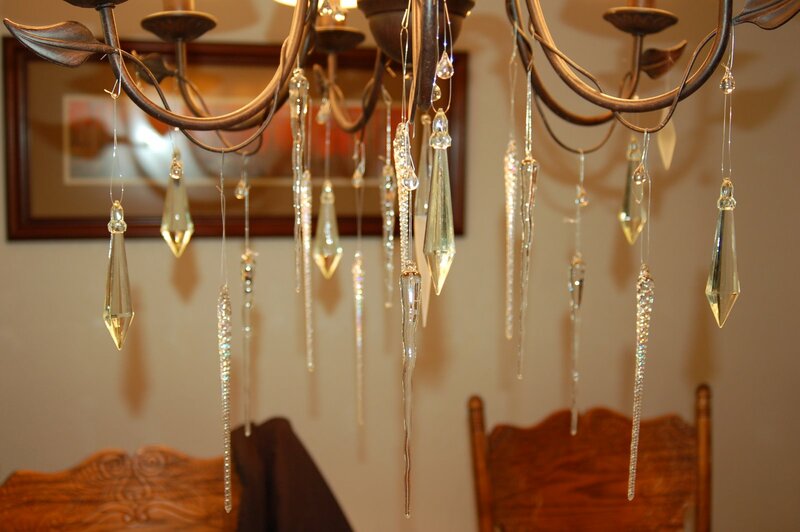 In the dining room we have icicles on the chandelier, and Rejoice & Wonder on the window sill. Not too much there since it’s a busy room when all the family is over. We were blessed to enjoy several holiday celebrations at our house this year. Not intended to be timed this way, but it ended up to be quite a marathon actually. My side of the family (around 23 people) were here on Sunday the 23rd, Terry’s family (about 18) were here on the evening of the 24th, and our immediate family of 5+1 on Christmas Day. Terry’s mom got to spend the night and opened presents with us on Christmas. We were so thrilled to have her here instead of being home by herself in Prescott. I know she loves it up there, but I hate that she doesn’t have any family in town to keep her company more…of course, maybe she likes it that way, but I doubt it after raising 6 kids of her own. It must be so quiet! I’ll post more on the actual holiday celebrations soon. I promise! Oh Nancy!!! 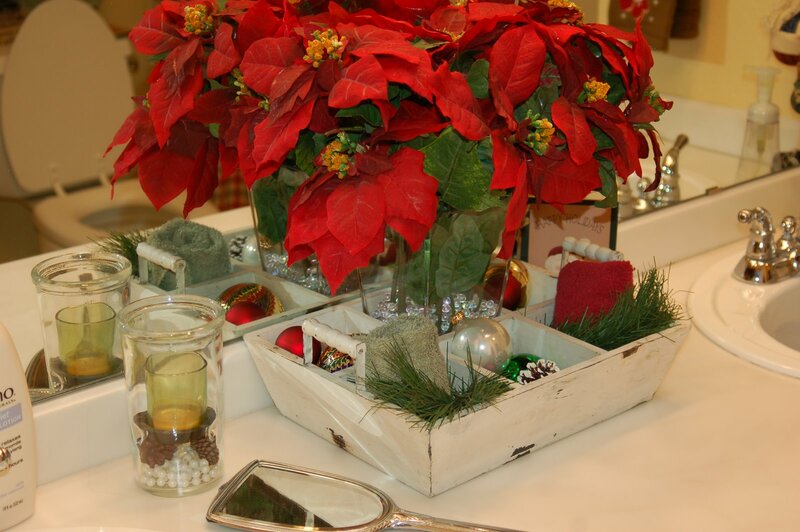 LOVE your Holiday decorations!And how fun that you can keep alot of it up into Jan. and Feb…. cuz it is so wintery!That branch is my very favorite EVER! Gotta get me one! Can’t wait to see how you decorate it for each of the seasons. See you tomorrow!